The rebuilding Pitt Panthers reminded Iowa that things typically aren’t so easy against fellow high-major teams — even ones that didn’t win a conference game last season. Freshman guard Joe Wieskamp had 18 points and 11 rebounds for his first double-double, Nicholas Baer scored 14 of his 16 points in the second half and the Hawkeyes held off Pittsburgh 69-68 on Tuesday night for their third win over a power program this month. Jordan Bohannon had 12 points and six steals for the Hawkeyes (6-0), who also took down Oregon and Connecticut at the 2K Classic in New York two weeks ago. “It certainly wasn’t a thing of beauty by any means. But that’s how games are sometimes,” Iowa coach Fran McCaffery said. A lot of that had to do with Pitt (6-1), which went 0-18 in the ACC in 2017-18. The Panthers put themselves in position for the upset — only to miss two shots in the final 10.4 seconds that would’ve given them the win. Iowa’s Tyler Cook grabbed the rebound of a missed 3-pointer by Connor McCaffery — only to brick both ensuing free throws. 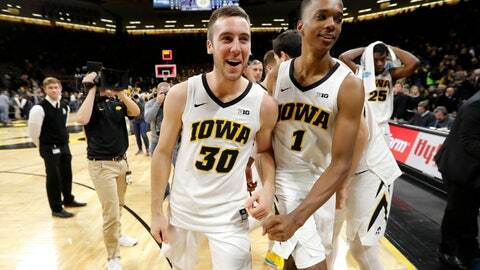 Trey McGowens and Sidy N’Dir each had chances for the game-winning shot, with Iowa only securing the victory when N’Dir’s desperate turnaround jumper in the paint went awry. A pair of crucial 3s by Baer helped Iowa jump ahead 64-62, capping a stretch of 11 straight points for the senior. But Kene Chukwuka pulled Pitt to 67-66 on an underneath bucket with 1:09 to go. Freshman guard Xavier Johnson had 18 points to lead the Panthers. Pitt: The Panthers have to be more than a little optimistic after their first performance on the road. They shot 61.3 percent in the first half at a venue they’ve never played in before and knocked Iowa’s potent offense off its rhythm for much of the night. Iowa said the procedure will remove hardware near Pemsl’s knee, which he injured twice in high school, and the school will apply for a medical redshirt after the season. The Hawkeyes should feel confident that the Big Ten will grant Pemsl’s request for another year of eligibility given that he played just 13 minutes, all in the season opener three weeks ago. Iowa should be able to absorb the absence of Pemsl, who has averaged 7.2 points and 4.7 rebounds per game in two seasons, because of its deep rotation. Iowa athletic director Gary Barta released a statement after the game saying he was aware the Hawkeyes’ broadcast team, made up of longtime announcers Gary Dolphin and Bobby Hansen, made negative remarks about Iowa’s play and players during a timeout. Barta said he had requested audio and will evaluate those comments after hearing it. “I see a lot of signs of encouragement. But I’m not happy we lost,” Capel said.